Rufus Chester Allen was born in Delaware County, New York on October 22, 1827.
with a company under the leadership of Apostle Parley P. Pratt. Rufus married Lavenia Elizabeth Hoopes Yearsley in Salt Lake City on June 26. 1853. Harmony much of this time. Rufus married Margaret Ruth McConnell in Salt Lake City on March 20, 1857.
and was the second counselor to Bishop George F. Jarvis of the St. George Second Ward. 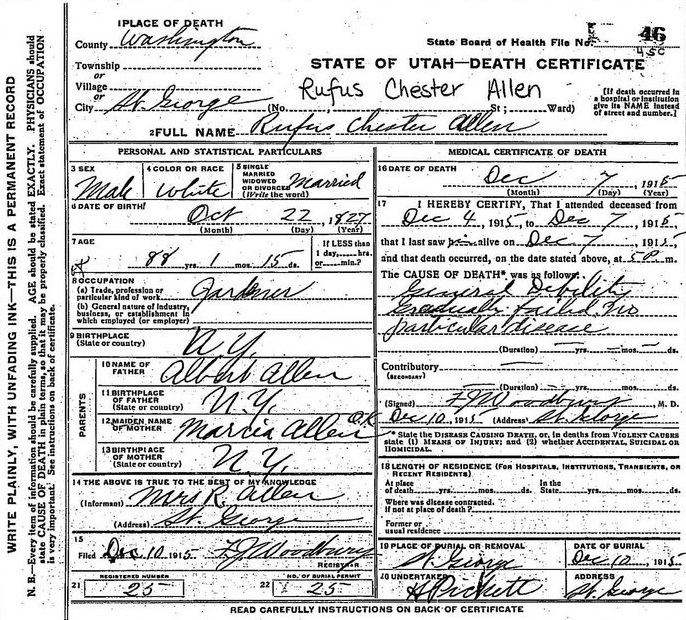 Rufus married Laura Elizabeth Chaffin in St. George on May 5, 1886. In 1891, Rufus & Laura purchased a home in St. George. on December 10 and he was buried in Plot B_9_21_6 of the St. George City Cemetery.